There is always something surprises you in the big cities. 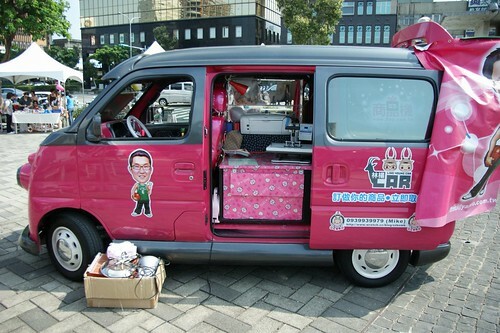 I found 3 mobile business vehicles at Huashan Creative Park in Taipei. Mobile business vehicle is not really a new idea, but these 3 cars really impressed me. 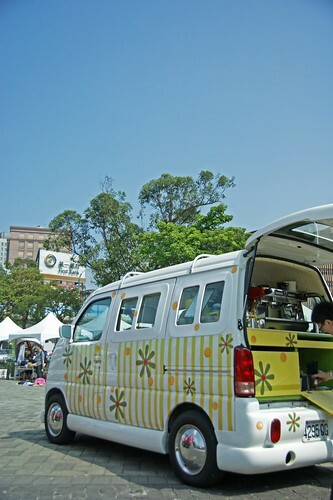 The first one is a Starbucks Coffee truck, I saw a lot of this kind of mobile coffee trucks, but the first time for Starbucks Coffee. Recently Starbucks is facing strong competition from local chain coffee shops and convenient stores. 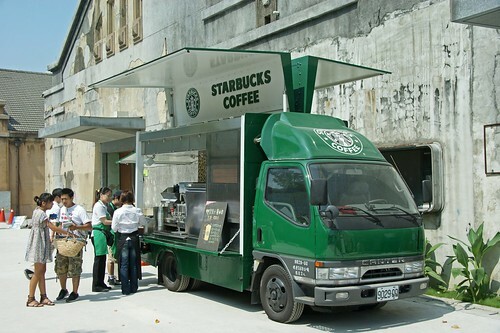 Maybe that is the reason they created this mobile Starbucks, or it is just for branding? Another 2 are for personalized products and coffee/tea businesses. They got my attention not because their businesses, but the cute appearance. They are all modified Volkswagen T1 with fancy interior design and lovely painting. These mobile business vehicles do not only provide service to customers, they also add some flavor to this city.